Original antique pieces to give your home back its individual character. Our genuine antique door knobs, door knockers, bolts, finger plates, escutcheons, letter boxes and latches etc., will certainly do this. One of our specialities is the supply of original rim locks. All are restored here in our workshop to full working order. Stock ranges from the 18th to 20th Centuries. Everything from chimney cranes to curtain rings. Coat hooks, beam hooks, door bells and fittings, air vents, stair carpet clips, cabinet and cupboard fittings, house names, decorative tiles, wrought iron wall ties and pipe brackets are only a few of our many period fittings. The Victorian Ironmonger - Passionate About Antique Door Fittings. Dave Thompson the business owner has been restoring period homes and properties for the last 40 years or so. These have included everything from a 1930's semi to a Victorian country railway station, and one the oldest village garages in the country. This knowledge and expertise is now available to you by visiting our online shop. There is no substitute for the real thing, you simply can't recreate age with modern materials. All of our original antique door fittings are as they were made by the local blacksmith (nearly every village had one) from wrought iron, or in the later Victorian factories in a variety of other materials, but now with the patina only possible by use over centuries. Some items will have wear but we sell nothing that isn't serviceable and good for another lifetimes use, hence our money back guarantee. 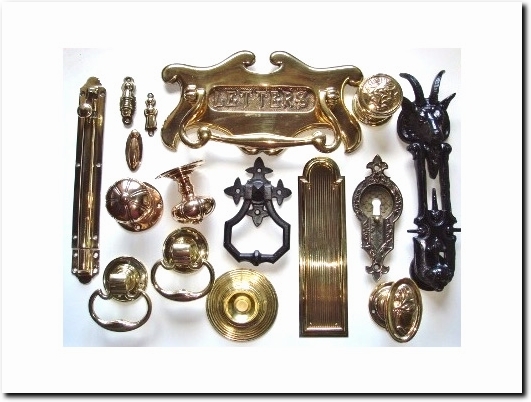 UK (Shropshire) based business - established in 1993 - providing antique door furniture and architectural fittings. Website includes e-commerce facilities, delivery and returns information (within terms and conditions), FAQs, testimonials, blog, full contact details.